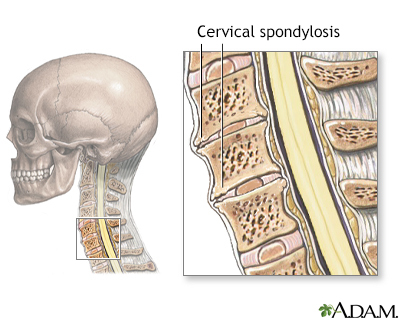 Ankylosing spondylitis (AS) is a chronic form of arthritis. It mostly affects the bones and joints at the base of the spine where it connects with the pelvis. These joints can become swollen and inflamed. Over time, the affected spinal bones may join together. AS is the main member of a family of similar forms of arthritis called spondyloarthritis. Other members include psoriatic arthritis, arthritis of inflammatory bowel disease and reactive arthritis. The family of arthritis appears to be quite common and affects up to 1 in 100 people. The cause of AS is unknown. Genes seem to play a role. Most people with AS are positive for the HLA-B27 gene. The disease often begins between ages 20 and 40, but it may begin before age 10. It affects more males than females. AS starts with low back pain that comes and goes. Low back pain becomes present most of the time as the condition progresses. Pain and stiffness are worse at night, in the morning, or when you are less active. The discomfort may wake you from sleep. The pain often gets better with activity or exercise. Back pain may begin in the between the pelvis and spine (sacroiliac joints). Over time, it may involve all or part of the spine. Your lower spine may become less flexible. Over time, you may stand in a hunched forward position. Fatigue is also a common symptom. Your health care provider may prescribe drugs such as NSAIDs to reduce swelling and pain. Some NSAIDs can be bought over-the-counter (OTC). These include aspirin, ibuprofen (Advil, Motrin), and naproxen (Aleve, Naprosyn). Other NSAIDs are prescribed by your provider. Talk to your provider or pharmacist before daily long-term use of any over-the-counter NSAID. Surgery, such as hip replacement, may be done if pain or joint damage is severe. Exercises can help improve posture and breathing. Lying flat on your back at night can help you keep a normal posture. The course of the disease is hard to predict. Over time, signs and symptoms of AS flareup (relapse) and quiet down (remission). Most people are able to function well unless they have a lot of damage to the hips or the spine. Joining a support group of others with the same problem may often help. Treatment with NSAIDS often reduces the pain and swelling. Treatment with TNF inhibitors early in the disease appears to slow progression of the spine arthritis. Baeten D, Sieper J, Braun J, et al. Secukinumab, an interleukin-17A inhibitor, in ankylosing spondylitis. N Engl J Med. 2015; 373(26):2534-2548. PMID: 26699169 www.ncbi.nlm.nih.gov/pubmed/26699169. Callhoff J, Sieper J, Weiß A, Zink A, Listing J. Efficacy of TNFa blockers in patients with ankylosing spondylitis and non-radiographic axial spondyloarthritis: a meta-analysis. Ann Rheum Dis. 2015;74(6):1241-1248. PMID: 24718959 www.ncbi.nlm.nih.gov/pubmed/24718959. Ward MM, Deodhar A, Akl EA, et al. American College of Rheumatology/Spondylitis Association of America/Spondyloarthritis Research and Treatment Network. 2015 recommendations for the treatment of ankylosing spondylitis and nonradiographic axial spondyloarthritis. Arthritis Rheumatol. 2016;68(2):282-298. PMID: 26401991 www.ncbi.nlm.nih.gov/pubmed/26401991. 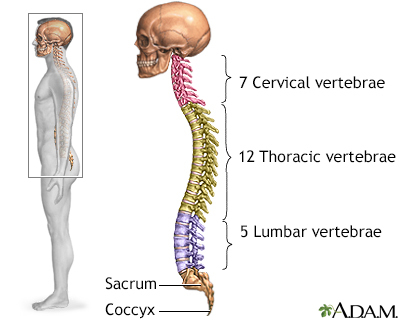 Werner BC, Feuchtbaum E, Shen FH, Samartzis D. Ankylosing spondylitis of the cervical spine. In: Shen FH, Samartzis D, Fessler RG, eds. Textbook of the Cervical Spine. Philadelphia, PA: Elsevier Saunders; 2015:chap 28.
van der Linden S, Brown M, Kennna T, Maksymowych WP, Robinson P. Ankylosing spondylitis. In: Firestein GS, Budd RC, Gabriel SE, McInnes IB, O'Dell JR, eds. Kelley and Firestein's Textbook of Rheumatology. 10th ed. Philadelphia, PA: Elsevier; 2017:chap 75.